Is your confidence to climb to the top in need of a boost? Are you on unsure footing but want to be on terra firma? Do you need to reawaken the ability to see world with child-like curiosity? 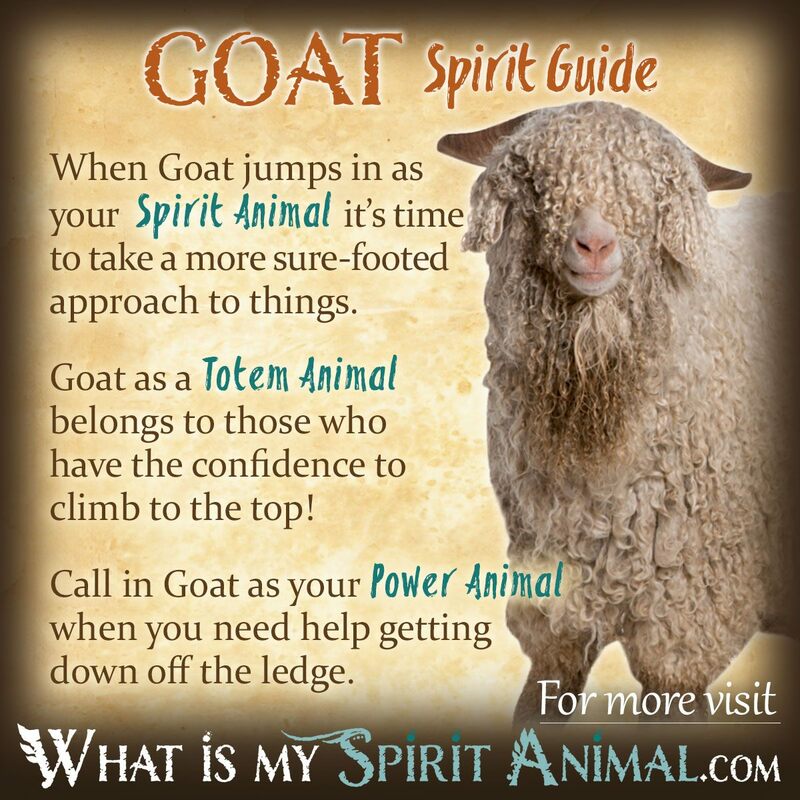 Goat as a Spirit, Totem, and Power Animal can help! Goat teaches you how to navigate rocky territory with ease all while teaching you joys of being a “kid” again! Delve deeply in Goat symbolism and meaning to find out how this animal spirit guide can support, assist, and inspire you. Goats are among my favorite animals! I grew up around them, having had several as pets and show animals. My favorite was a rust colored Nubian goat named Sylvia. I’ve often heard folks refer to Goats in a negative manner. Never, ever underestimate the ‘ignoble’ Goat. They are as smart and loving as Dogs and Pigs. I trained my Sylvia to do things most people can’t get their Dogs to do. Sylvia helped open my eyes and heart to the world of animal communication. When I would lay down in the field she would snuggle next to me, laying her head on my chest – always on top of my heart. She was one of my best friends and I miss her every day. Goat symbolism horns into a great number of myths and folklore as an emblem of sensuality, determination, health and vitality. A male Goat represents virility while the female Goat epitomizes reproduction and abundance. In some areas Goat meanings get mixed with those of antelopes or gazelles. Greek mythology reflects the idea of virility abundantly with figures like the Satyrs who are half Goat and half man, Zeus being suckled by a the Goat whose horns became the Cornucopia (adding the metaphysical meaning of plenty, sustenance and nurturing), Artemis’ sacred Goat and the Goat being an aspect of Dionysus. Bacchus had a cart driven by Goats. It is no surprise that Bacchus and Dionysus are both a tad rowdy sexually, so the Goat may offer the message of reining in your lust for something tamer. Then there’s Thor – the God of Thunder. Goats were chosen to draw his war chariot into battle. While a myth, the human choice to have Goats be the animals trusted by the God of Thunder says a great deal about how fearless Goats can be. Historically speaking Goats were domesticated nearly as early as dogs. Many parts of the Goat proved useful to travelers from Goat skin water bags to Goat hair rugs. Unfortunately for the Goat it was also a sacrificial animal (i.e. scapeGoat). It is hard for New Age seekers to understand animal offerings, but it truly was an act of respect. Any such animal was considered very valuable and nothing would go to waste. Using this perspective Goat may symbolize your need to give up something in order to obtain something else that’s far more useful in your daily life. Arabic stories give the Goat a reputation for having great dignity and composed behavior unlike the sheep who is meek and mild. In European writings Goat is associated with the obstinate and tenacious side of human nature. The Chinese depict male Goats as embodying the Yang principle, overall goodness and harmony. Somewhere along the way Christianity began associating the poor Goat with Satan. During the Middle ages superstition had it that Goats could distract the saints by whispering to them lasciviously. This connection may have come from the idea that Goats are lustful, leading to many paintings and drawings of Satan as having a Goat face and horns. Logistically most occultists and New Age teachers do not apply this Goat symbolism, looking more to Goat spirit as a power animal, totem and guide. The Goat as a Spirit Animal makes certain that you maintain your balance. Whether climbing a narrow mountain ledge of challenges or walking a calm wooded path, Goat has sure-footed determination. See, it takes only two inches of space for a Goat to gain a solid foothold. Two inches. Can you imagine climbing a mountain with only two inches of Mother Earth beneath your feet? But, sometimes life is like that. If we want to reach for the stars we have to trust our ‘self’ and find the confidence to lead our own charge and climb toward the heavens. Pay attention to your Goat guide’s gender. A male Goat as a Spirit Animal brings you inventiveness, assertiveness and the ability to figuratively regenerate something in your spirit you thought was long lost. He also offers you the opportunity to reconnect with Nature, particularly the animal world as a teacher. The female Goat spirit, by comparison, has come to nurture you and “feed” your soul. Think about what you lack in your connections with the Divine and the esoteric realm. When Goat offers you her milk, accept it with the awareness that it a sacred form of nourishment – she is, for this moment, your “nanny” in all things spiritual. Also, Goat may come to you as a Spirit Animal when you are bored with life. Goats are the world’s greatest detectives (2nd only to Cats). Their curiosity knows no boundaries. Allow Goat medicine and energy to help you explore new experiences and communities. Don’t stay shackled in the pen you’ve created for yourself. Even the tiniest things in life can excite, if you’ll just be open to seeing them. If Goat is your Totem Animal you are comfortable reaching for new heights that might be outside your comfort zone. You take life one moment, one step at a time. As a Goat ‘person’ you instinctively know when and whom to trust. Even when the ground may look very uncertain or dangerous, you proceed cautiously, yet confidently, letting Goat’s energetic stability guide you. Contrary to folklore, Goats do not eat everything. They are extremely picky eaters. It only looks like they are always eating because they are constantly using their highly sensitive lips and tongues to gauge the world around them. This means that Goat people take the time to think about what they say. They understand thoughts become things. Additionally, with Goat as your Totem Animal, the energies of preparedness, achievement, overcoming obstacles and working diligently for something close to your heart are inherently part of who you are. Finally, those with Goat as a Totem Animal tend to be underestimated – often choosing to work behind the scenes rather than being ‘the star of the show’. Also, those with Goat as a Totem animal are likely to be overlooked and underestimated. Goats aren’t known for the ‘wow factor’ like Horses, Sharks, Tigers, Lions, Eagles, Hawks, Scorpions, etc. But that’s OK. Sometimes flying under the radar can be your strongest asset. Call on Goat as your Power Animal when you need independence coupled with plenty. You are ready to take on something new, and there is no need for guilt. Goat medicine gives you confidence and firm cornerstones for personal or spiritual development. For those who find themselves stuck or wholly misplaced, the Goat Power Animal gets you moving again. Let that energy take you where you NEED to be for finding answers. Goat may not move swiftly, but slow and steady is best when you start losing balance. Once you’re on your way with Goat guiding, you’ll find the determination necessary for success. Also, while mostly docile creatures, male Goats should never be underestimated. When battling for territory or mating rights to a female, male Goats will lock horns. The WHACK and THUD of horns hitting horns is like a mini-explosion! Hearing and seeing this in person gives one tremendous respect for the sheer strength and resilience of male Goats. Also, male Goats do not waste energy when fighting. They are patient and do not rush in. If you have a person or situation that you need to face head-on, bide your time. Stay focused. Your chance will come. When it does, do not hesitate. As long as you’ve invoked Goat as your Power Animal you’ll likely come out on top! Domesticated Goats and Sheep were introduced to Native American tribes during the early 1900’s so there is little talk of Goats in the Native American culture. However, what little we find indicates Goat spirit as a creature of service, curiosity, and intelligence. Anything new becomes an item for exploration. Other symbolic values for Goat include tenacity (bordering on stubbornness), sky magic / medicine and protection. Goat appears in Celtic symbols as the ancient deity Cernnunos, a horned God. While little is known about this Being, there seems to be connections with the Green Man, the legend of Herne the Hunter and the Roman God Mercury. Cernunnos appears in carvings with Goat horns, seated as if meditating. Many depictions include groupings of animals surrounding him. Put this together and we see the symbolic value of ties with nature, the masculine aspect and fertility. Dreams about Goats may be a pictorial pun that someone is “getting your Goat.” Alternatively perhaps you feel wrongly blamed and have become the “scapeGoat” of a situation. Learn more about Goat Spirit by reading Dreams About Goats on WhatIsMySpiritAnimal.com! In the Western Zodiac, Goat (Sea Goat) appears as the Zodiac Sign of Capricorn. Although Capricorn’s symbol is a mythical creature (Sea Goat), it rules the tenth house of astrology. The tenth house is defined by the Midheaven, the highest point of the horoscope. The Midheaven represent the highest aspirations of your life (your vocation, calling, life’s work, etc). Just like Goats can climb trees and mountains with only the tiniest foothold to keel them balanced and stable, those born under the Capricorn Zodiac Sign can do the same. On my sister-site, BuildingBeautifulSouls.com, read all about the Capricorn Sign Traits & Personality to learn more about Goat as a Spirit, Totem, and Power Animal. Keeping Goats with cattle prevents loss of calves before birth in the herd. Goats living with horses make the horse content. Goats calm nervous horses boarding seafaring vessels. Having a black Goat meet you on a bridle path means there’s hidden treasure near. Meeting a Goat before an important trip portends good luck. A bride seeing a tethered Goat when leaving the church means she’ll experience good fortune in the future. It means there was good fortune in your past that you missed out on or didn’t realize. Probably was misinterpreted at a younger age. If you think back, it was probably tied to something that was weighing on you at that time in your life or some question you were seeking the answer to.